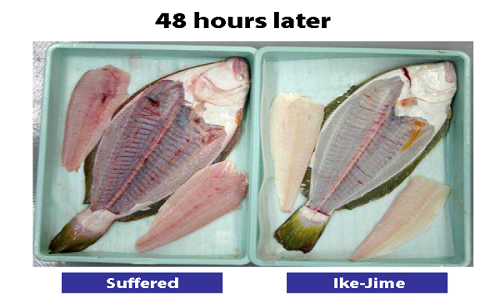 Ike jime is a flesh preserving and taste enhancing Japanese method of killing or paralyzing the fish, this method is used so that the quality of flesh or the meat is maintained even after the fish is dead. It is a traditional Japanese method of killing the fish which is now used across the globe for its positive results. Ike jime method as described by some is “killing the fish without the flesh knowing that it is dead”. By severing the spinal cord and the brain of the fish, the pain and the suffering is minimizes as a result of which the rigor mortis of the fish’s body is delayed which causes the flesh to become stiff. Also when the brain and the spinal cord of the fish is destroyed, it actually short circuits the pain and stress response of the fish due to which there won’t be any body or muscle movement which in otherwise will consume Adenosine triphosphate (ATP) in the muscle, and as a result produce lactic acid, making the fish sour. 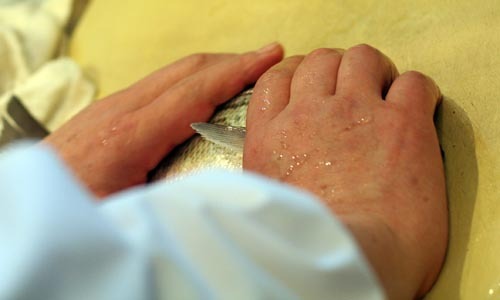 1) Hold the fish with your left hand on the chopping board, make sure the fish is relaxed. 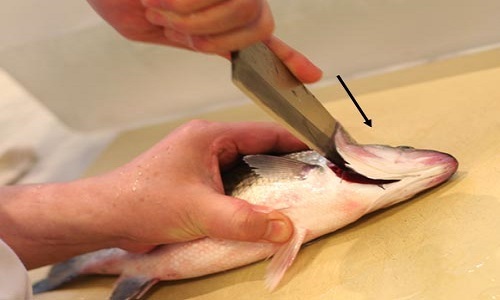 2) Take a knife in your right hand and put it under the gill flap, behind the gills towards the upper portion of the head or else you can pierce the head using a needle also called as ”Coring the Brain”. 3) Push down the knife and severe the spinal cord and the blood vessels. Be careful at this part as u might accidently puncture the heart and spoil the whole process. If the process is done right, then the fish should give a shudder, mouth should fall open and the fin should fall open and relaxed. 4) Now immediately severe the spinal cord and blood vessel as the tail end of the fish. 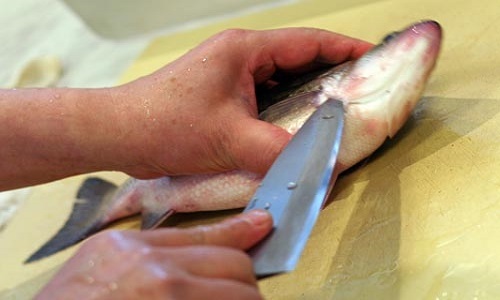 Make sure you don’t chop of the whole tail, you always want the fish to be intact. 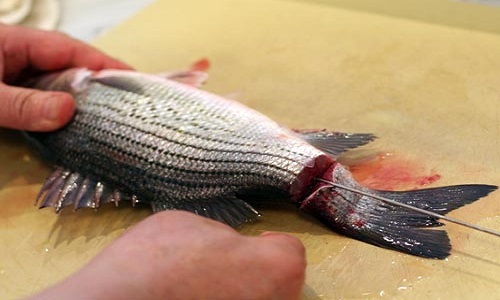 5) Shove a needle all the way down the spine of the fish, this is an important part where “killing the fish without the flesh knowing it that it is dead”. The fish gives one last shudder here before relaxing completely. The process is also known as “Pithing”, if this goes wrong then the whole effort will be spoiled and you will have to do it all over again with another fish of course. 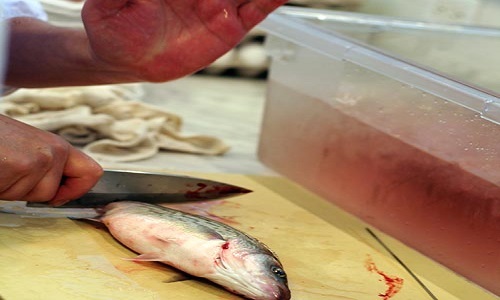 6) Now put the fish in the ice slurry and allow it to bleed out, here the fish’s natural circulatory method is used to remove the blood as the heart is still alive and it pumps out all the blood. The head and the tail of the fish should be bent and the body should be kept straight. 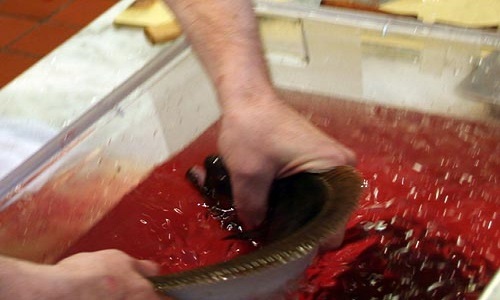 7) After all the blood is drained the fish is ready to be sold or to be prepared in any dish. 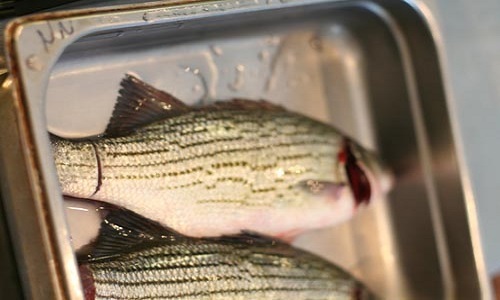 The fish which are killed by this method are priced high as they have longer shelf life also the taste is flavorful. Knife is very important part of kitchen. When you want to cut big fish or any types of fish chef knife is very need for it.